Yuri Kochiyama was born in 1961. She and her family were interned in Jerome, AK for the duration of WWII in an American concentration camp, and after the war, she and her husband, Bill, moved to Harlem, where they became active with a variety of social justice movements. Kochiyama is most famously known in activist circles for her friendship with Malcolm X and her work with his organization and other Civil Rights organizations of the 1960s and 1970s. There is a very famous photo of Kochiyama cradling Malcolm X's head right after he was shot--it can be seen in Renee Tajima-Pena's excellent documentary Honk if you Love Buddha or My America. Kochiyama had a passion for social justice. In addition to working on Civil Rights with African American activists, she was active in anti-Viet Nam war protests, she worked with Puerto Rican activists agitating for Puerto Rican independence, she labored on behalf of Japanese American reparations for the injustice of the internment, and for general Asian American causes. 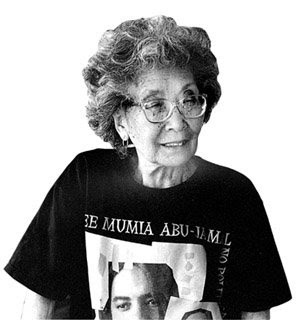 And even today, when Kochiyama is in her 80s, she continues to be involved in educating younger generations about Civil Rights and social justice and to be active in protesting for causes she believes in, as the tee-shirt she wears below clearly indicates her support for social justice issues. Yuri Kochiyama is an amazing woman--she is an inspiration because of her activism and the way she has always worked as an ally in various communities, ones beyond her own identity as a Japanese American/Asian American woman. And truly, that is what mixed-race America is all about--going beyond your own interests and understanding the way that we are all mixed here together--someone else's injustice is OUR injustice. Thank you Yuri Kochiyama, thank you. Thanks for stopping by Patrick. And I agree--I think Yuri deserves many more accolades and much more recognition than she has generally received. I do think that within certain communities--Asian American studies, various activist circles, anti-racist organizations--she is appreciated and heralded as a true pioneering force of cross-racial/ethnic alliances. Perhaps more people in the future will be inspired by her example. I hope so. "Mary Nakahara" who was to rename herself Yuri Kochiyama. The Marsh Theatre in San Francisco will showcase a 20-min. excerpt on 11/17 & 12/1 @7:30pm for its Monday Night Series that previews new works. I wrote the 1st draft in '00 & have tried unsuccessfully to meet Yuri, whom I idolize...until last week when someone gave me her address and I went to visit her unannounced. Yuri is famous for not seeing visitors w/o an appt. but when she heard I'd written this play, she was thrilled and invited us into her home. A local Filipino American actor, Jean Franco, came w/me because he was dying to meet Yuri. He performed a monologue for her & she was obviously moved. Yuri has an amazing generosity of spirit. She called me afterward to tell me how much she loves the script & she's not only coming but inviting the other surviving "crusaders." I'd read her autobio, watched "Passion for Justice," and longed to meet her...but nothing prepared me for her warm, big-hearted charisma. For years, I let the play sit in a drawer because I'm a Russian-American-Jewish woman and not Asian, so who am I to try to write about internment? Then I read that she had similar apprehensions re meeting Malcolm X, & that gave me courage. I second your emotions in this blog. Yuri is an international treasure! Thank you for keeping her name in the public eye. Marian, your comments inspired me to write a whole post on the topic of allies--check it out (today's date is November 15, 2008). Wish I could see your play--so glad you got to meet Yuri Kochiyama--I'm envious! Hi, Jennifer: Here's the scoop on our production in SF. 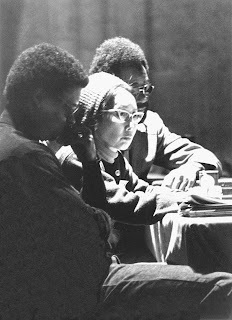 Yuri Kochiyama attended. We've got photos, etc. which I'd love to post to your site or you can visit the links in this account. Asian Week gave it a good write up. Reception has been enthusiastic. On Nov. 17 and Dec. 1, an all-Asian American cast graced the stage at San Francisco’s The Marsh Theatre to perform 20 minutes of scenes from playwright Marlan Warren’s World War II internment play Bits of Paradise, and made some history of their own. The seven actors took the audience back in time when 20-year old internee Yuri Kochiyama (born Mary Nakahara) started a letter-writing campaign to the Japanese American 442nd regimental combat team to raise the men’s spirits. The girls and women called themselves “The Crusaders,” and the play--an ode to Kochiyama—came alive as actors read verbatim excerpts. Warren directed 15-year old Chanelle Yang (Mary Nakahara) and Linda Wang (Yuri Kochiyama). Connie C. Kim, Pisha Warden and Linda Wang stood in for the hundreds of Crusaders, and Wesley Cayabyab, Jean Franco, Wilton Yiu did the same for the soldiers. Warden also portrayed an evacuee diarist (based on The Evacuation Diary of Hatsuye Egami). Yuri Kochiyama and original Crusader Ruth Ishizaki thrilled both actors and audience by attending the first show.